Charge your smartphones, tablets and laptops simultaneously with this Belkin Store And Charge Station. You can charge up to 10 different kinds of devices at the same time, each with its own charging cable or adapter. It is designed for digital learning classrooms, keeping students' tablets, Chromebooks, and e-readers secure, charged, and ready for use. 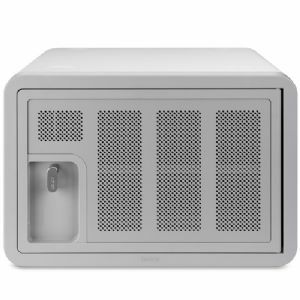 Featuring a lockable enclosure that protects mobile devices from tampering and theft when not in use. This charging station also includes space for labels to quickly identify and access devices. Its built-in cable management helps keep tangles and clutter to a minimum. Manage your mobile devices with this elegant, affordable 10 Outlet Belkin Store And Charge Station.